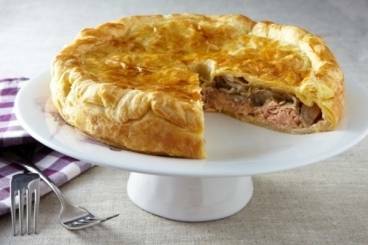 A puff pastry pie with a smoked salmon and creamy endive filling. Wash the endives and cut away the tough base of the stem. Separate and thinly slice the leaves. Cut the smoked salmon into thin strips. Heat a frying pan and add olive oil. Sauté the endives with a pinch of salt until they start to soften. Add the cream to the pan and cook until reduced by half. Add the lemon juice and season with salt and pepper. Roll one sheet of puff pastry out on to a baking sheet. Lay the smoked salmon on top and then add the cooked endive. Brush the beaten egg around the edge of the pastry and then lay the second sheet of puff pastry of top. Press the edges firmly together to seal. Brush the pie with beaten egg and then refrigerate for about 20 minutes. Remove the pie from the fridge and use the tip of a knife to cut a decorative pattern into the top of the pastry. Make sure to cut through the top layer of pastry to allow steam to escape from the pie as it cooks. Transfer to the oven and bake for 25 to 30 minutes. Once crisp and golden brown, remove from the oven and serve hot.